(Toronto, Ont) The top junior wheelchair basketball teams on the globe are making final preparations for what promises to be eight days of fierce competition as the Men’s U23 World Championship returns to Toronto. 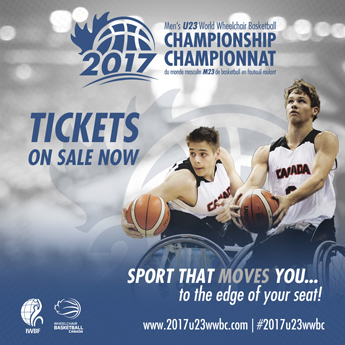 The 2017 Men’s U23 World Wheelchair Basketball Championship runs from June 8-16 and features 12 teams from four International Wheelchair Basketball Federation (IWBF) zones as they vie for the highly coveted world championship title. In Pool A, sports fans can watch potentially heated matches between several contenders including the previous host Turkey, three-time bronze medallists Australia, one-time silver medallist Brazil, and host and two-time gold medallist Canada. Italy and Iran, who will be making their second Men’s U23 World Championship appearances will also compete for a top spot in Pool A. Pool B features the reigning champion, Germany, the United States boasting two gold medals, one silver and one bronze, as well as one-time silver medallist Japan. Rounding out the group of teams battling for position in Pool B is Great Britain, France and South Africa. Confidence is high for Turkey’s return to the world championship stage after hosting the 2013 tournament in Adana. Although the team has fallen short of the podium at their previous three world championship appearances, Turkey took the top spot at the 2017 U22 European Championship and has set their sights on a high finish this year. Team Australia has competed at four of the five previous world championships. Throughout these appearances Australia has claimed bronze three times and narrowly missed the podium in 2009 with a fourth place finish. The Australian men head into the 2017 Men’s U23 World Championship in search of another back-to-back finish on the podium. 2017 marks the fourth trip to the world championship for the Brazilian Men’s U23 National Team. Brazil last competed at the world championship in 2009, where the team placed seventh. The team has placed as high as second throughout their history at the tournament, when they hosted the event in Blumenau, Brazil in 2001. The Brazilian team heads into the 2017 Men’s U23 World Championship hoping for a return to the podium. Host team Canada will be competing for their third podium finish at the world championship and is looking for redemption coming off a sixth place finish at the tournament in 2013. 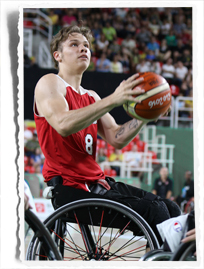 The Canadian roster features offensive stars Liam Hickey and Ben Moronchuk who joined the Canadian Senior Men’s Team at the Rio 2016 Paralympic Games. Hickey and Vincent Dallaire were part of the Canadian team that fought for a second place finish at the 2015 Parapan Am Games and are also the two returning players from the Canadian side that competed at the last world championship for junior men in 2013. With the seasoned Paralympians and Parapan Am medallists leading the Canadian roster, the host team seeks to use that experience to capture a spot on the podium. The Italian U23 men have competed at only one previous world championship where they fought to an eighth place finish in 2013. With a team headlined by high scorer Sabri Bedzeti and a fourth place finish at the 2017 U22 European qualifier, Italy is looking to improve upon their standing at the 2017 Men’s U23 World Championship. Rounding off Pool A is Iran with their second appearance at the tournament after a fifth place finish in 2013. In lead up to the tournament, the Iranian men are coming off their second consecutive first place finish at the Asia-Oceania U23 qualifier where their star player Mohammadhassan Sayari also claimed the title of top point producer at the tournament. The team appears poised to start climbing up the world rankings. In Pool B, Germany enters the tournament on a high note. As the reigning world champions, Germany is one of the teams to beat in Toronto. The team has achieved podium success only once at past world championships for junior men. After qualifying with a bronze finish at the 2017 U22 European Championship, the German men will have to work hard to defend their title. Team USA has been among the top powerhouses in junior men’s wheelchair basketball, having enjoyed great success at four of the past five world championships. The American men boast podium finishes in all of their previous appearances at the event, including back-to-back gold medals in 2009 and 2005. The team will look for a return to the podium after an absence from the event in 2013 and a dominant performance at the 2017 Americas Cup qualification tournament where American Kyle Gribble was named tournament MVP. The Japanese Men’s U23 National Team has competed at the past three world championships. The team has placed as high as second in its history at the tournament, reaching the podium only once in their debut appearance in 2005. Most recently, Japan placed ninth at the last world championship for junior men in 2013. The French Men are coming off of a fifth place finish at the 2017 U22 European Championship, where the team seized the final qualification spot for the right to compete at the 2017 Men’s U23 World Championship. France is looking to improve upon their 10th place finish at their most recent world championship appearance. This year marks South Africa’s third appearance at the event, having played at the most recent championships in 2013 and 2009. After dominating opposing teams at the U23 African World Championship qualifier, the South African team enters the tournament looking to improve on their previous two 11th place finishes. The tournament gets underway at 8 a.m. on Thursday, June 8. Preliminary play wraps up on June 12, with the quarter-finals and semifinals set for June 14 and 15, respectively. The bronze and gold medal games will play out on Friday, June 16 starting at 10 a.m. ET.